Are you ready for some football? 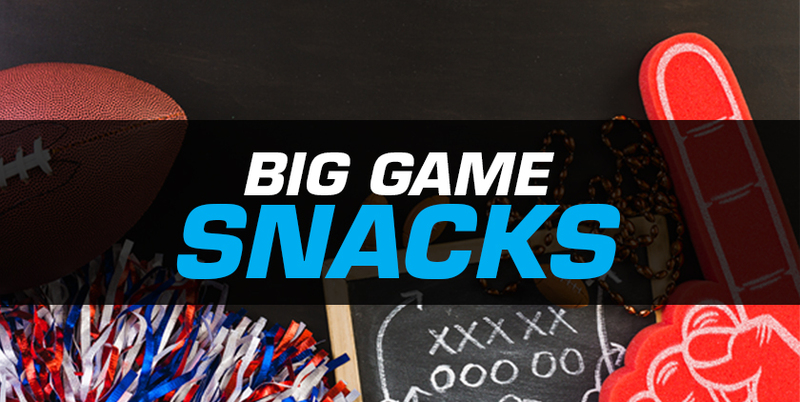 Score major points with friends and family alike with these five Big Game recipes. You don’t have to tell them they’re delicious AND nutritious! Drain the chickpeas into a strainer and rinse under cool running water. If time and patience allows, pinch the skins from each of the chickpeas, which will make the hummus smoother. Combine the chickpeas, olive oil, tahini, lemon juice, garlic, salt and pepper in the bowl of the food processor. Process the hummus continuously until it becomes very smooth, about 1 to 2 minutes. Scrape down the sides of the bowl as needed to integrate any large chunks. Taste the hummus and add more of any of the ingredients to accomplish the desired flavor. If the hummus is stiffer than you want, add more lemon juice or olive oil to thin it out and make it creamier. Transfer the hummus to a bowl and serve with raw celery and carrot sticks. Toast the oats for about 8 to 10 minutes. You’ll notice them start to brown a bit and harden in texture. Place all of the ingredients in the food processor and blend until a dough consistency forms. Remove the dough from the food processor and roll small chunks of it until you form a ball. Repeat this process until you have used all the dough. For an extra treat, pour additional pancake syrup into a bowl and additional coconut into another one. Dip each ball into the pancake syrup and then coat with the coconut. Enjoy immediately or store in the refrigerator for later. Position an oven rack 4 to 5 inches from the heating element. Preheat the broiler. Brush a 10×15-inch, broiler safe, rimmed baking sheet with coconut oil. Put the turkey, egg, breadcrumbs, scallions, fish sauce, red pepper flakes, ½ teaspoon salt and a few grinds of black pepper in a large bowl. Mix gently, just enough to incorporate evenly. Drop mounds of the mixture all around the prepared baking sheet and press them into an even, single layer. Score the meat into 24 even squares, cutting down almost all the way. Brush the top with the hoisin sauce. Broil until the meat is browned and glazed, and registers 165 degrees F on a meat thermometer, about 8 to 9 minutes. Carefully pour off any excess liquid from the baking sheet. Rescore the meat into 24 sliders, then follow the score lines with a spatula to divide. Top each slider with a cucumber slice and a cilantro leaf. Arrange the lettuce, remaining cilantro, carrots, onions and lime wedges on a serving platter. Put the peanuts and Sriracha, if using, in small serving bowls. Slide a spatula in the pan and let guests build their own sliders with their desired toppings. Position an oven rack in the top of the oven and preheat to 350 degrees F.
Preheat the oven to 400 degrees F. Put a rack on a rimmed baking sheet. Arrange the potato skins skin-side up on the rack and brush with 2 Tbsp. coconut oil. Bake until the skins are slightly browned, about 20 to 30 minutes. Let cool completely, then cut each in half crosswise. Arrange the pieces skin-side down on the rack and sprinkle each with mozzarella, Parmesan and scallions. Bake until the mozzarella melts, about 8 to 10 minutes. Remove the potato skins from the oven and top each with some salsa verde and avocado. Sprinkle with crushed chips. In a large bowl, mix together gelatin powder, 1 scoop of your favorite Best BCAA™ flavor and 1 cup of boiling water. Stir for about 2 minutes or until powder has dissolved. Add 1 cup of cold water and stir briefly. Pour the mixture into a mold and place in the refrigerator. Let sit for 4 hours.